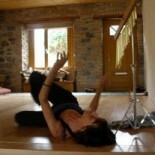 This workshop introduces participants to the Contemplative Dance Practices of Barbara Dilley (www.barbaradilley.com). Booking – please contact me via text on 085 1260931 or email bernidivilly@gmail for details. Dates: tbd Contact me if interested. Cost: €500 for full course. Small group. In these four workshops, participants will be taking on a dance of delight involving developmental milestones and intense learning. We will focus on the dance of delight of the here and now while remembering. Recover the wisdom of the first year of life. This is where we hardwire our neural pathways and organize ourselves for the relationship. This fundamental grounding eventually helps us to stand on our own two feet and we begin to develop our unique gait. Moving through early developmental reflexes and patterns, participants will have an opportunity to yield, to push, to reach and pull and find themselves in the relationship with their own ground. Early developmental patterns are fundamentally helpful in restoring confidence and well being. Come and play. Slide, slip and slither as you remember your foundations and enjoy developing your tone. If you haven’t worked with me previously, there is an intake interview. Life begins with contact between egg and sperm. In the unfolding dance of conception, implantation, differentiation, and development in the womb, we grow ourselves for life on Earth. We are born, and our birth imprints influence how we manage our lives through growth, transitions, and change. Our earliest existential experiences establish the baseline for our personalities and our attitudes and set up the deepest challenges that we navigate throughout our lives. Revisit in a minded environment your earliest reference experiences, and re-engage and renew your creative spark. If people haven’t worked with me previously, an intake interview is advised, for which there is a cost. Alternatively, interested participants can attend a taster session with others interested in participating. Please contact me to arrange. Dates: tbd contact me if interested?